Anyone who’s ever visited a yacht show will know that, when it comes to planning your schedule, working out which yachts are worth your precious time can be an arduous task. With the upcoming Palma Superyacht Show promising a stellar line-up of over 80 yachts, it’s going to be important to get your priorities right. Whether you’re looking to buy or are in the market for an unforgettable charter, two yachts which definitely shouldn’t be missed are Rainbow and Blues. Represented for sale and charter by YPI, the 40 metre sailing yacht Rainbow is one of the most elegant vessels on the waves. Delivered in 2012 by Holland Jachtbouw, she is the newest J-Class reproduction and is currently the only J-Class yacht available for charter. She is also one of only three J-Class yachts currently offered for sale making this an unparalleled opportunity to own what is globally recognised to be one of the finest sailing yachts around. Developed using the plans for the original 1930 Rainbow, which was built for Harold Vanderbilt to a design by William Starling Burgess and took victory at the America’s Cup in 1934, the modern Rainbow combines classic lines with modern comforts and technology. 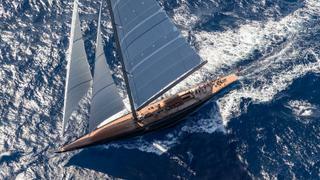 Ideal for those who like to race around the regatta circuit, her naval architecture by Dykstra has been designed to meet the J-Class Association maximum performance rules while her sail plan includes cutting-edge North Sale 3Di sails and custom high-speed hydraulic winches. A hybrid propulsion system means Rainbow also boasts a reduced ecological impact and lower sounds and vibration levels with silent sailing capable for overnight passages. Also perfect for lazy vacations, Rainbow’s interiors were designed by Dykstra in partnership with deVosdeVries design and feature mahogany panelling and art deco detailing throughout. Accommodation is for six guests in a beautiful owner’s cabin and two twin cabins with Pullman berths while al fresco relaxation areas include dining areas on the cockpit and foredeck. 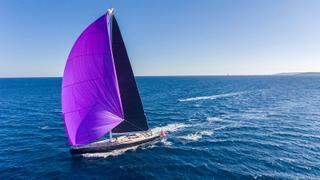 If you’re looking for something a little smaller, YPI will also have the 30 metre Southern Wind sailing yacht Blues on display at the Palma Superyacht Show. With frequent upgrades throughout her life, Blues is now listed for sale representing a fantastic opportunity for keen sailors to own a high-spec sailing yacht. Designed inside and out by Nauta Design, with naval architecture by Farr Yacht Design, Blues is the second hull in the award-winning SW100RS series and features a high-modulus carbon mast and EC6+ carbon rigging with a sporty design with a low coachroof and an open transom. This sporty character extends to the yacht’s interior which features a low, wide saloon with an adjacent study ideal for relaxing after a long day at sea. Guest accommodation extends from amidships all the way forward, occupying the quietest part of the yacht, comprising a forward master suite, double VIP cabin and two twin cabins.